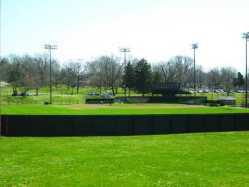 Southeast Missouri State University students know Capaha Field as the home of Southeast's baseball team. It's a place to go to spend a lazy afternoon and get a good baseball fix for free. However, when the Southeast baseball season comes to a close and many students go back to their hometowns for the summer, the field stays behind. From late May to the end of July, the field is home to American Legion baseball and the Capahas. American Legion baseball is made up of local high school athletes. It has baseball teams throughout the United States. The Capahas are a historic amateur baseball team that has been in existence since 1894. The player's don't get paid. The team's coach, Jess Bolen, has been coaching since 1967. The field was even home to the St. Louis Browns, now the Baltimore Orioles, for spring training in 1943 and 1944 due to travel restrictions during World War II. The stands behind home plate provide a nice view of the field for fans to watch the game, while the scoreboard in left field makes the game easy to follow. Thanks to Bolen, his wife, Mary, and founding members of the Capaha Field Improvement Committee, which was formed in 1988, fans are able to enjoy baseball at the field today. "The reason why I formed the committee is that the ballpark was in such bad shape," Jess Bolen said. "The baseball field was -- they had no grass infield, had no outfield fence, permanent, press box was as big as my fireplace -- it wasn't up to snuff." The field was in almost non-playable condition. "The college team played there, SEMO baseball didn't even start until 1958 or something like that," Jess Bolen said. "We [the Capahas] played out there and the fences were really short, and they'd take them out for the fair." The Capahas had a doubleheader scheduled against a team from Waterloo, Ill. in which both teams hit for a combined 16 home runs. "Every time you gave up a pop fly it was a home run," Jess Bolen said. "One year we played 60 games and 47 were on the road, that's how bad I hated the field." Jess Bolen asked Jon "Doc" Yallaly, an American Legion coach, Jay Crosnoe, a local business owner, and Jim Grebing, an editor of a newspaper, to start up the Capaha Field Improvement Committee. With the approval of the city council, the committee was created. They would have to get its plans approved by the city council, and then go to the City Planning Committee to make sure their plans met safety regulations. "The city wouldn't donate money, but we got labor," Jess Bolen said. "When we put new seats in and closed it in, the city would do the labor, we would furnish the material. So, we kind of formed a partnership with them." Once Bolen and the committee started fixing up the field, they'd find something else wrong with it. "So, we said the first thing we need to do is put grass in the infield and move the fences back and put in permanent fencing," Jess Bolen said. "So that's what we did. We moved the lights back and that cost $25,000 to do that. We put in a chained link fence and closed it in and that's how it got started." Mary Bolen was a member of the committee for 15 years. "We fixed the batting cages," Mary Bolen said. "There hadn't been a batting cage, we built all that. We built the new dugouts that went up. The netting in front of the bleachers there where it's a soft net now. That use to be wire." The City of Cape Girardeau took back full control of the field in July 2012. Southeast rents the field during the season. Thanks to the committee, the field is in playing condition. The actual age of the field is unknown but it's believed to have been created in the late 1920s or early 1930s, according to Mary Bolen. 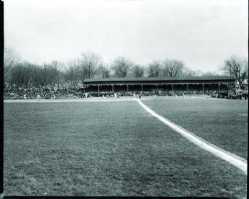 That is when the Capahas used the field for home games. "The location in most ballparks is no better," Jess Bolen said. "That's a beautiful location for a baseball field. You've got that pond out there. Kids can fish there. You've got picnic areas and everything. I don't know how it can be a better setting."